Captain Silver (キャプテンシルバー / 캡틴 실버) - USA All sides - Scans - SMS Power! You're Jack Avery, a lad with a taste for treasure and high adventure! 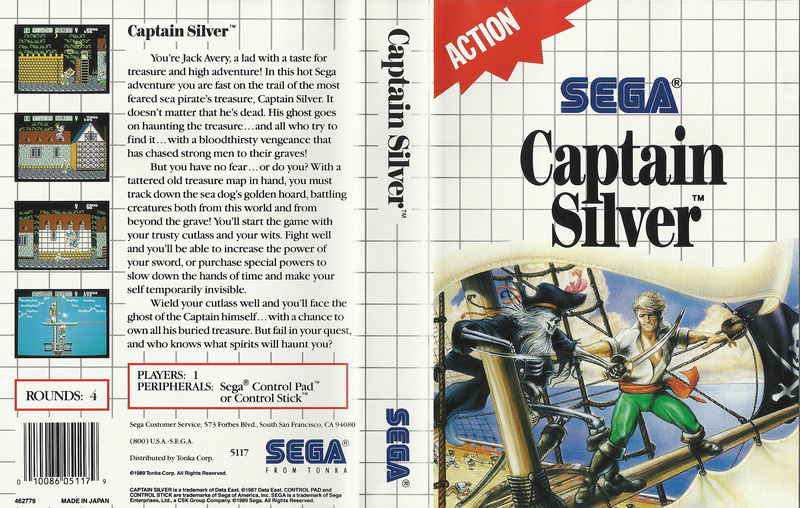 In this hot Sega adventure you are fast on the trail of the most feared sea pirate's treasure, Captain Silver. It doesn't matter that he's dead. His ghost goes on haunting the treasure... and all who try to find it... with a bloodthirsty vengeance that has chased strong men to their graves! But you have no fear... or do you? With a tattered old treasure map in hand, you must track down the sea dog's golden board, battling creatures both from this world and from beyond the grave! You'll start the game with your trusty cutlass and your wits. Fight well and you'll be able to increase the power of your sword, or purchase special powers to slow down the hands of time and make yourself temporarily invisible. Wield your cutlass well and you'll face the ghost of the Captain himself... with a chance to own all his buried treasure. But fail in your quest, and who knows what spirits will haunt you?